Dive into fun at the WALT DISNEY WORLD® Resort water parks. Whether you choose to play at Disney’s Blizzard Beach or Disney’s Typhoon Lagoon, you’re sure to have fun in the sun! The Walt Disney World® Resort is known around the world for its four magical theme parks. You may be surprised to learn that the resort is also home to two world-class water parks; Disney’s Blizzard Beach and Disney’s Typhoon Lagoon. Some might even say that a visit to Walt Disney World® isn’t truly complete without stopping by one – or both – of the thrilling Disney water parks! You can easily upgrade your tickets to include the water park and more option. This is the most affordable way to visit either or both of the Disney water parks. From relaxing on a lazy river to speeding down a slide, there’s something for everyone at the Walt Disney World® Resort water parks. Families of all sizes and ages will have a blast splashing around in the sun here. While it’s easy to decide on visiting the water parks, it can be hard to pick which one. We recommend visiting both if you are able, but know many families like to reserve a full day for their water park fun. Disney’s Blizzard Beach is a great choice for those looking for the ultimate thrill. The huge water park is home to some of the most daring water rides, like Summit Plummet and Slush Gusher. Blizzard Beach also offers a few “chill” rides as well as a kids only area for those not quite ready for the thrill rides. Disney’s Typhoon Lagoon offers a blend of excitement and relaxation. Family-friendly rides include the brand-new Miss Adventure Falls and Castaway Creek. Or, you can try out Crush ‘n’ Gusher – a one-of-a-kind water-coaster that will have you holding on tight. Both Disney water parks are fun for the whole family, so we know you’ll have a good time no matter which one you visit. It's also important to note that in the off-season, only one of the Disney water parks will be open at a time. During the summer months, both Disney water parks remain open daily. You'll want to check the resort's official calendar to see which of the Disney water parks are open during your vacation. 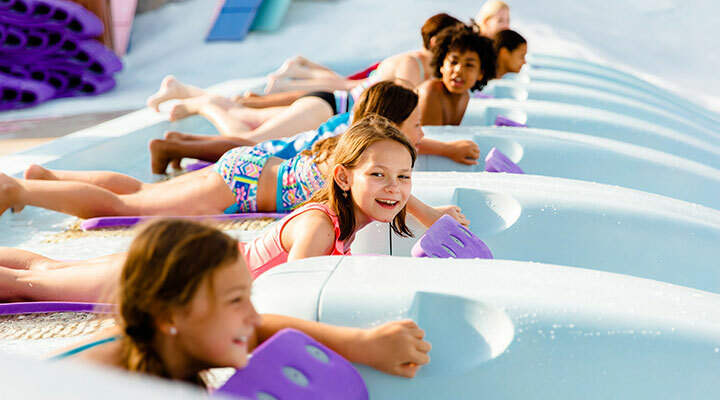 Conquer a slope like no other, or splash around with the whole family at Disney's Blizzard Beach. This watery wonderland will be one of the coolest places you'll visit on your vacation. 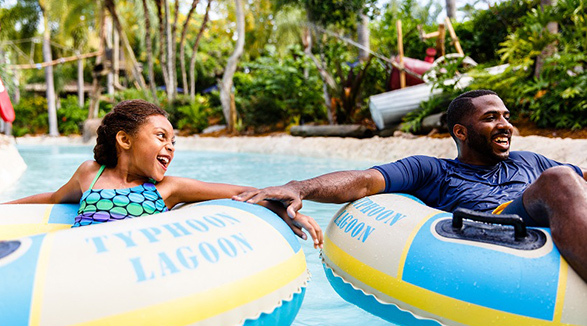 Plunge into fun when you spend your day splashing around at Disney’s Typhoon Lagoon water park. There are slides, pools and rides for everyone.